You are visiting The Netherlands during the autumn season, but you have no clue about what things you should do? Search no more! 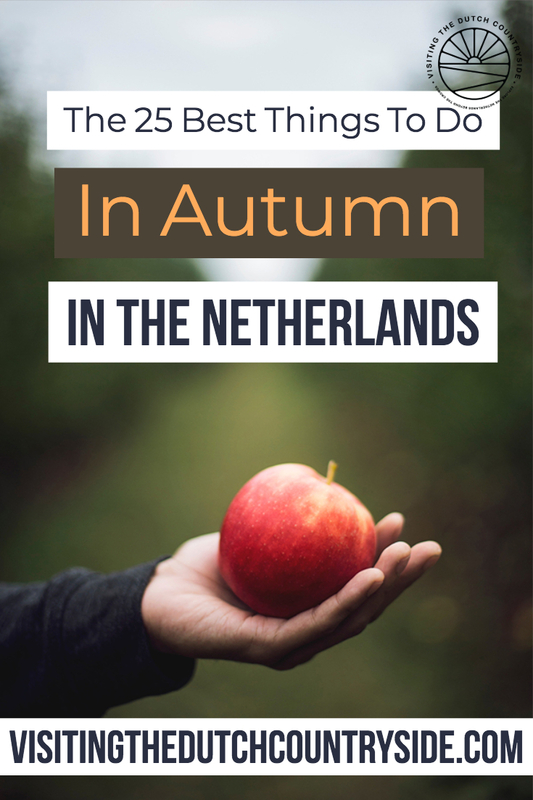 Right here you will find 25 best things to do during the autumn months in The Netherlands. If you are also wondering what the autumn months in Amsterdam and thus, The Netherlands, are and when autumn starts, continue reading. The dates of the autumn season in The Netherlands are every year the same. Autumn in The Netherlands is from 21st of September until the 20th of December. The Netherlands is a beautiful destination, also during fall. The fall colors in The Netherlands are gorgeous and there are plenty of things to do during autumn. But many don’t know what activities they should do during autumn in The Netherlands. It can get tricky. So that’s why I will help you out with this list of the 25 best things to do in The Netherlands during the autumn season. Even in Amsterdam, autumn makes you feel like you landed into a fairy-tale. At the beginning of November museums in Amsterdam will open their doors for the Museumnacht Amsterdam (Museum night Amsterdam). More than 50 Amsterdam based museums are open from 19:00 – 02:00. So, for all the night owls out here, go for it! There will be permanent collections and temporary exhibitions, but also live music, performances, special tours and plenty more to discover in museums all over Amsterdam. You will get a wristband as soon as you enter the first museum. This gives you access to the other museums in Amsterdam. But don’t throw the ticket away, because they can still ask to see it at the next museum. This year it takes place on Saturday the 3th of November 2018. So if you are in Amsterdam at that time, go for it. 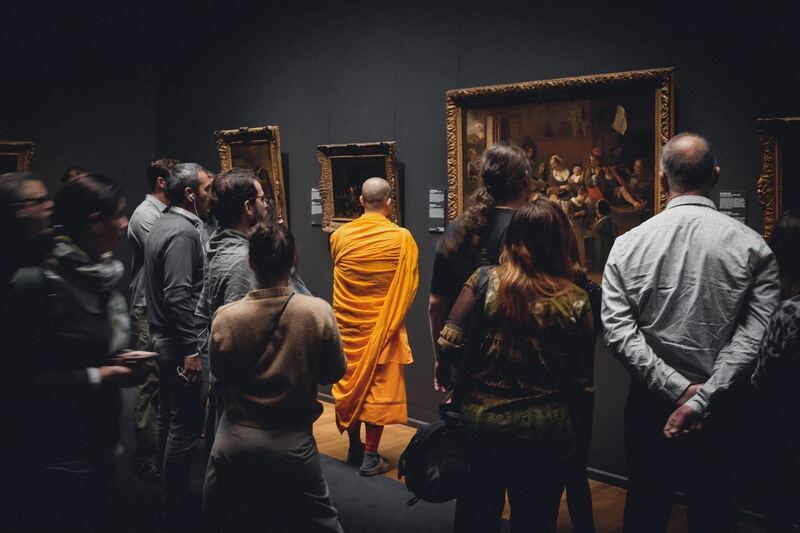 Visiting museums during Museumnacht is one of the things you have to do in November. Have a look at the website here. Note: The tickets can only be purchased via Dutch bank accounts. The reason why is because this is a local event and thus geared towards a local audience. I would ask your hotel or hostel to make a reservation on your behalf. If you are in Amsterdam during autumn, you should visit at least one film festival. A few film festivals in Amsterdam that are worth a visit are IDFA, or International Documentary Film Festival, and KLIK, where they show animated works. The film festival season in Amsterdam lasts from September till November. Have a look here to see what other festivals there are. October is the season for apple picking in The Netherlands. If you love apples as much as I do, then this is the time for you. Fresh, crunchy apples. That you picked from the trees yourself. Life truly doesn’t get any better than this. You can go pick apples in plenty of orchards during autumn in The Netherlands. You can walk between rows and rows of perfect apples. Many orchards also have pears that you can pick, although generally the pear season starts a little earlier than the apples. Pear season generally finishes the third week of September. 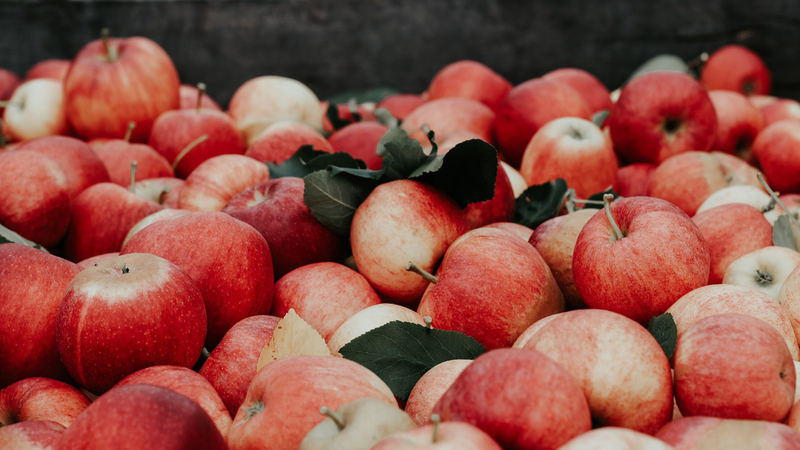 Keep in mind that the opening times of most of these apple orchards change because when the apples are gone, they are gone. So always check their websites for the current information. Do you want to know what the best orchards in The Netherlands are where you can pick your own fruits? 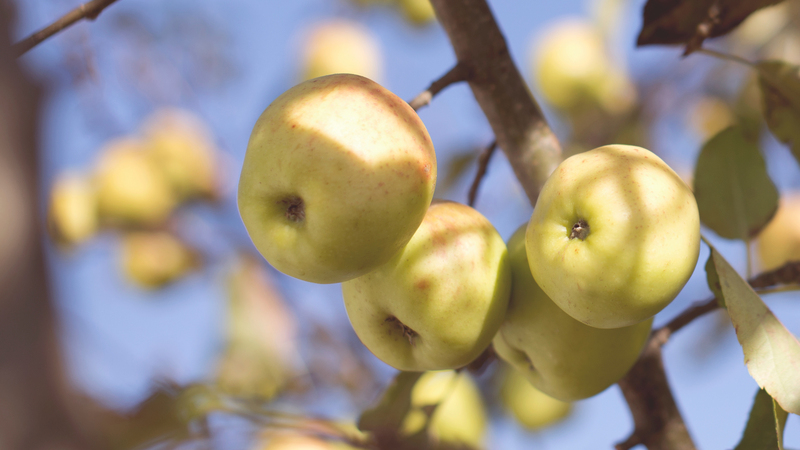 If you are looking for an orchard near Zwolle, then you should head to Fruittuin Verbeek. This is located in Oldebroek (Vierhuizenweg 5, 8096 RP, Oldebroek). Have a look at their website here for the opening times, go to ‘Beleven’ and then ‘Zelf fruit plukken’ to see what you kind of fruit and species you are allowed to pick. If you are looking for an orchard near Amsterdam, then Olmenhorst is your best bet. Check their website for the current opening times. My country is stunning. No matter what season. But , the nature in The Netherlands during autumn is beautiful. Nature knows how to leave me in awe every single time I see heather. 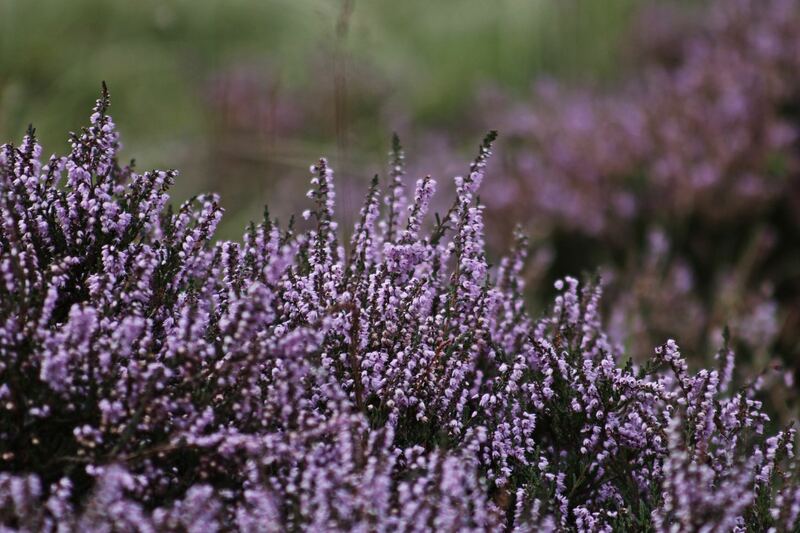 You will see the moorlands in national parks in The Netherlands covered with heather. The beautiful light purple colour especially shines brightly during the golden hour time but will take your breath away no matter what time of the day you are exploring the Dutch moorlands in full bloom. There are many parks that have moorlands and you can take your bike to go for a ride or go for a walk. Ask at your local tourist information if they have a little map and are up to date with the rules. Keep in mind that you should NEVER walk in the heide, nor go off the paths. Paths are there for a reason. Stay on them. Bokbier is a dark, seasonal beer that will be sold in The Netherlands between October and February. The beer has a caramel-like flavour. So even if you are not a real beer fan, I would suggest you give bokbier a try when you are visiting The Netherlands in autumn. There are many different bokbieren as every Dutch brewery (small or big) makes their own bokbier. The beer that is sold in the period of October and February is called herfstbock, or autumn bock. Because the bockbeer season is special, every year there are many festivals on the release and start of the bockbeer season. Some of the festivals you should visit are the Bockbierfestival in Utrecht on the location of Ledig Erf. Another bockbeerfestival in The Netherlands that is worth a visit is the Amersfoorts Bockbier Festival. Stamppot is typical Dutch food and I love it. When the autumn and winter season has arrived, you cannot make me any happier than with stamppot. Okay. You can. With ice on the canals. Anyway. There are many variations of stamppot that we make in The Netherlands, but it exists out of mashed potatoes and veggies mashed together. In general, there will be a piece of meat with the stamppot, but you don’t have to take that if you don’t want to. Walk into any foreign supermarket and you will see strange things. You will be surprised with the supermarkets in The Netherlands as well. You can get many typical, festive Dutch treats in the supermarkets, such as pepernoten (literal translation: peppernuts… It doesn’t taste like pepper, don’t worry.). Go to your local supermarket and buy pepernoten. I’m serious. Another thing that we eat during the autumn and winter period (as a treat or snack) are oliebollen. They are doughnuts, but not the ones you expect. If you want there is a layer of powdered sugar on top, and they come in all variations. Want an appelbol (applebol)? Not a problem. Want a krentenbol (currantbol)? You got it. I did notice something though. When I was researching if people would be interested in an article like this I came across an article. In that article, they mentioned that ‘crunchy spiced cookies called speculaas’ are only available during the festive season. Well. I don’t know in what world they live in, but not in The Netherlands. I cannot live without speculaas. So yes, you have to try speculaas when you visit The Netherlands, but it is not temporary in the stores. So, in case you did think speculaas was temporary, I hope I cleared it up. If you are an EDM, house, techno or dance lover, then you most likely have heard of ADE, The Netherlands. From the 17th of October until the 21st of October the Amsterdam Dance Event takes place in Amsterdam, The Netherlands. Even in the middle of fall Amsterdam still has festivals, while looking gorgeous. Amsterdam Dance Event is one of the most important events in the dance world. The most important DJ’s, labels and people of the dance world come together. They network, give performances, give masterclasses and much more. Many big DJ’s such as Martin Garrix, Nicky Romero, Tiesto and Hardwell (who takes a well-deserved break after the 2018 ADE) are actually Dutch. Visiting ADE is definitely one of the things you should do when you are in Amsterdam in October. Have a look at the schedules and activities here. While going to the beach is something most people associate with beautiful weather, in The Netherlands we do it a little different. Because our weather is so unpredictable we love to go to the beach on a stormy day in The Netherlands and go ‘uitwaaien’. Uitwaaien doesn’t have a translation to English, but it means something like out blowing (literal translation). But basically something like putting your worries aside, while relaxing and getting fresh air. One of the things you shouldn’t miss when autumn has arrived in The Netherlands is the foliage period. Take a walk through any forest that you can find and enjoy it. See the different colours of the leaves and spot animals that are preparing themselves for winter. If you don’t fancy walking, then you can always go by bike. Keep in mind that there is no exact time of when the leaves change in The Netherlands or in Amsterdam. It depends on how much rains have fallen, how the wind behaves and what the temperatures have been. It might don’t sound too tempting, but there’s quite a big chance it will happen to you. Why? Because the weather in The Netherlands is unpredictable, not because it rains that often. Drinking tea, with a piece of Dutch apple-pie (appeltaart), is the perfect way to spend an autumn afternoon in The Netherlands. Going to a spa in The Netherlands might not come up in your thoughts straight away when you think about The Netherlands. I can assure you, we have great spas. If you need some relaxing during the moody weather, then this can help you. Keep in mind that you have to enter spas in The Netherlands fully naked. Unless you are coming to the special bikini days. You would need to check when those are exactly as this differs per spa. Some have these days on Tuesday and Thursday, others once a week. One of my favourite spas is Spa Zuiver in Amsterdam. Have a look at their website here. The Netherlands has amazing museums to visit. There is a museum for everyone, from the Kröller- Müller Museum, where you will find one of the biggest collections of paintings and sketches from Vincent van Gogh in the world, to the National prison museum in Veenhuizen where they talk about the way prisoners were punished and kept from the 1600s until now. And, of course, Het Rijksmuseum. One should never miss out on this amazing museum in Amsterdam, but I figured by now everyone knew the name already. Don’t forget the whipped cream! After an afternoon ice-skating it often feels like the perfect treat. If that doesn’t sound like one of the best things to do during autumn in The Netherlands then I don’t know what will. Although. What is the best way to spend a rainy day in Amsterdam or Utrecht than to stroll along the endless stalls with food, clothes and much more. You can definitely spend a rainy Autumn day in The Netherlands in one of the many indoor markets that my country has to offer. Have a look at De Utrechtse Bazaar which is opened every weekend, you have to pay an entry fee of 3,50 euros. Twice a month there is a local goods weekend market in de foodhallen in Amsterdam. Microbreweries are incredibly popular in The Netherlands. Thus, the perfect way to spend an autumn day with a tour and tasting through one of the many microbreweries in The Netherlands. For instance, Brouwerij Troost in Amsterdam has a guided tour every Saturday on 16:00 for 6 euros (people under 21 can only go in when they are accompanied). Or go to Den Haag (they also have another one in Amsterdam) to Brouwerij De Prael for a guided tour. The price starts at 8,50 euros per person, and you have to reserve a place for the tour. Have a look at their website here. Reserve a high tea at one of the many places that offer one throughout The Netherlands. Keep in mind that we add our own little touch to the food. So, if you are expecting an English high tea… Well, you’re not in the UK. So. I’m sorry. But drinking lots of tea is the perfect way to spend your day during the autumn season in The Netherlands. If you have watched any Winter Olympics you should know one thing, Dutch people like ice-skating and are pretty darn good at it. That’s why you can find an ice-skating rink anywhere from Amsterdam to Heerenveen and from Assen to Breda. From mid-October, you can skate your heart out in The Netherlands. If you are looking at skating in Amsterdam don’t skate at the ice rink in front of the Rijksmuseum, go to the Jaap- Eden baan instead, or when you’re in Heerenveen go to Thialf. 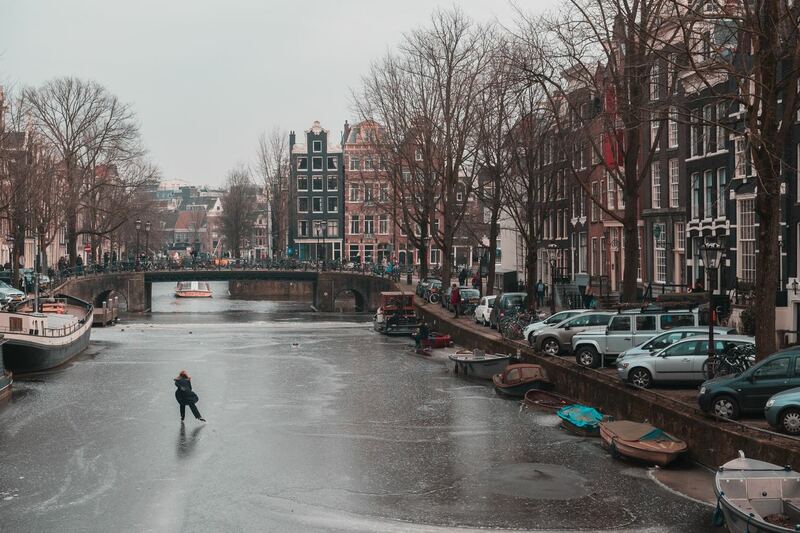 Unfortunately there is a very, very small chance ice-skating on the canals of Amsterdam or anywhere else happens in autumn in The Netherlands. Hopefully it does happen in the winter though. If you’re lucky enough, the autumn months in The Netherlands sometimes have sunny weather. We, Dutchies, like to enjoy the sun until the final moment. So as soon as there is a beautiful day, you can find people outside on the terraces. Wadlopen? Yes. Wad walking. Basically, you will walk on the mudflats of the Wadden Sea. 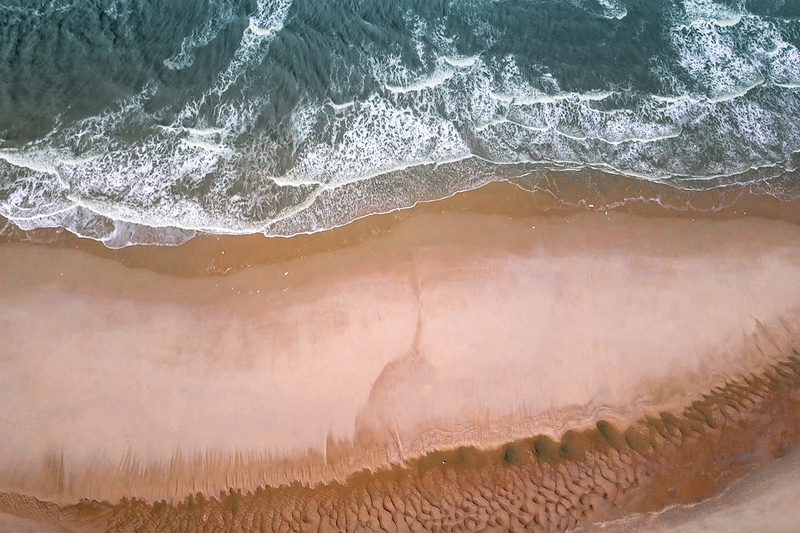 The Wadden Sea is a Unesco World Heritage site, as there is nothing quite similar to this natural wonder on the rest of this enormous planet. While the weather can be rainy during the beginning of autumn in The Netherlands, you will get dirty anyway. You walk over mudflats, through the water of the Wadden Sea and, depending on how hard of a tour you picked out, will get mud everywhere. If you opted for the light tour, then you won’t get much mud on yourself. Just don’t wear bad shoes (the mud is stickier than you think so you will lose your shoes) and white clothes. Go to this website to look at the options. Sometimes you just want to chill after you walked through the rain. That’s okay. Traveling and exploring can be tiring, so you deserve a bit of a break sometimes. If you want to go to the cinema in The Netherlands during autumn, don’t just go into the typical Pathe movie theaters. Have a look at Cinecitta in Tilburg, go to Cinelounge in Hoofddorp or go to the Tuschinski theatre in Amsterdam. They are all beautiful cinemas. In any big city, such as Utrecht, Breda, Amsterdam, Rotterdam etc., you can find many different cuisines. So, what better way to spend your autumn day in The Netherlands with a food tour. You have to at least eat Indonesian food (rijsttafel is a must), Surinam food and real Dutch food. So, breakfast, lunch, and dinner are fixed. If you are fed up with the bad autumn weather, you can always escape and visit one of the many botanical gardens in The Netherlands. The weather will be a lot more pleasant inside, plus you can sit there for hours while sipping on your tea and have a photo opportunity for the gram. If you’re in Leiden you should head to Hortus Botanicus Leiden which will blow your mind. One part of the garden even dates back to 1594(!). In Amsterdam, you have to visit the botanical garden Hortus Botanicus. It is located in the middle of the city centre and dates back to 1638. Once you walk inside this botanical garden in Amsterdam, you will leave all the crowds behind you. This might sound strange, but honestly, it’s not. 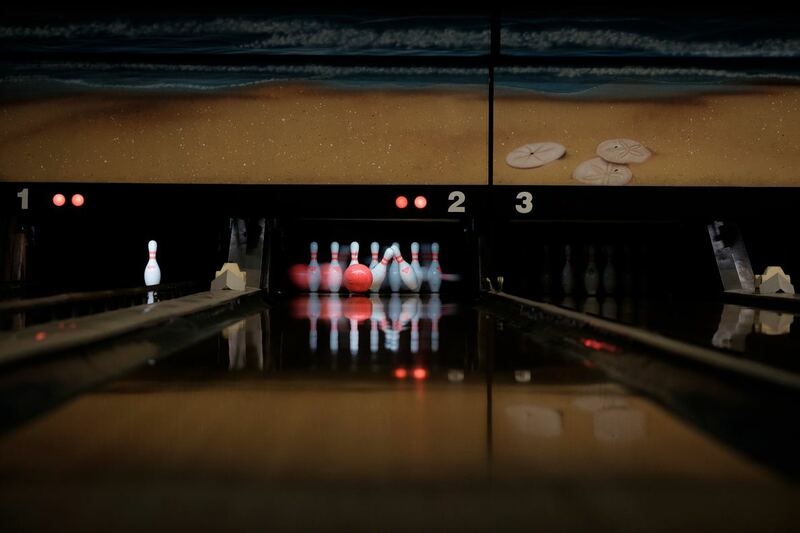 What better things to do on a rainy day in Amsterdam than bowling? It’s something we often do with birthdays or family days. And if you are with a big group in The Netherlands, then bowling is perfect. Gwen is a Dutch woman who is the chef of your class, she has an Indonesian mother, so she knows what she is talking about. The cooking workshop on time. So, if the autumn weather in The Netherlands has disappointed you, you can book a longer experience. You can even learn some Dutch while you are preparing wonderful meals. The price is 54 euros per guest. Have a look here to get more information. When it rains, it rains. Deal. You can get annoyed, or you can just deal with it. Use it to your advantage and visit all those museums in The Netherlands you wanted to visit. Or grab your raincoat and go outside. Enjoy the most scenic places in The Netherlands with a bit more water than you wanted, but not any less pretty. Don’t you know what clothes, raincoat or stuff you need to pack on your trip to The Netherlands? Stop worrying, I’ve got your back. Click here for my packing list article for The Netherlands, including tips on how to dress for all the seasons. Yes. This includes tips on your autumn wear and how to dress for winter in The Netherlands. Are you traveling to The Netherlands during autumn soon and was this article helpful for you, let me know in the comments below! Or maybe you have already visited The Netherlands during the autumn season? Anything else you’d add? Share this post! !